Published on November 29, 2017 in Allenatori, Calcio, Corsa, Generale, Giovani, Mental coaching, Olimpiadi, Stress, Tennis and Tiro a volo. 0 Comments Tags: attenzione, emozione, Nideffer, prestazione, TAIS. 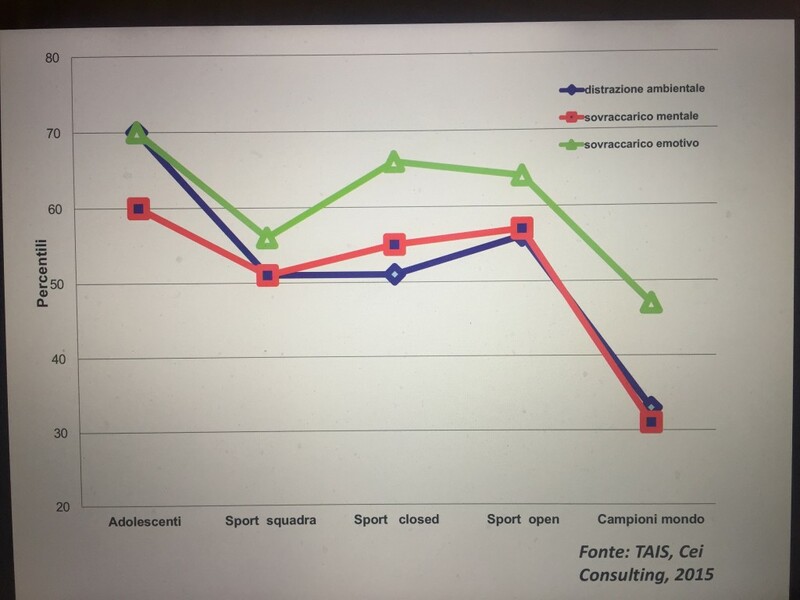 TAIS is a system for assessing attentional and interpersonal style and these data show that élites’ emotional overload is an important component reducing their performance, including world record holders, who instead suffer less the environmental distractions and cognitive mental overload. This also explains why top athletes use psychological preparation programs to reduce competitive stress. Published on March 23, 2016 in Allenatori, Calcio, Corsa, Generale, Giovani, Mental coaching, Olimpiadi, Stress, Tennis and Tiro a volo. 0 Comments Tags: attenzione, concentrazione, focus, TAIS. In business, as in sport, the competitive arena is now worldwide. Technical and tactical advantages are rapidly disappearing. With deadlines tighter and pressure to perform increasing, the ability to control concentration and emotions is critical. That’s where we come in. Our performance-enhancement systems combine sport and business psychological research to give you the winning edge. When we use terms like coaching, team building, and competition, we know what we’re talking about. Ask yourself what the best business executives have in common with elite athletes and Navy SEALS — the ability to pay attention, to avoid becoming distracted and remain focused on the task at hand. Whether you are a business executive or an athlete — you can’t perform effectively if you can’t concentrate. Mistakes break deals and lose games. EPS has developed the most effective tool in the industry for assessing attentional and interpersonal skills enabling individuals, teams, and companies to perform better. Unlike many other programs, Enhanced Performance Systems employs a performance-based instrument — The Attentional & Interpersonal Style (TAIS) inventory — to gain crucial information useful over a wide range of applications from executive coaching to employee selection and screening. It is no surprise that sports metaphors are widely used in business. Both arenas employ strategic planning, emphasize competition, and demand performance under pressure. TAIS has been used to enhance the performance of some of the world’s most talented athletes and teams. Why is it an advantage to have a background in sport and coaching and an instrument that has been tested in the athletic arena? Because, unlike in business where mistakes may take years to be detected and where improvements are often measured subjectively, in sport, it’s crystal clear what works and what doesn’t. You can’t charm your way to a four-minute mile and money won’t buy you a seventy at Pebble Beach Golf Course. Attention is the only relevant thing in the crucial moments. Published on January 20, 2014 in Allenatori, Generale, Mental coaching and Stress. 0 Comments Tags: attenzione, business, excellence, performance, TAIS. Give yourself the winning advantage we call “global fitness”. It is no surprise that sports metaphors are widely used in business. Both arenas employ strategic planning, emphasize competition, and demand performance under pressure. EPS was founded by one of the country’s leading sport psychologists, Dr. Robert Nideffer. TAIS and ACT have been used to enhance the performance of some of the world’s most talented athletes and teams. Why is it an advantage to have a background in sport and coaching and an instrument that has been tested in the athletic arena? Because, unlike in business where mistakes may take years to be detected and where improvements are often measured subjectively, in sport, it’s crystal clear what works and what doesn’t. You can’t charm your way to a four-minute mile and money won’t buy you a seventy at Pebble Beach Golf Course.